My family does NOT like change when it comes to the holidays. They want the same thing every year. Every. Single. Year. “It’s tradition!” they say. “You don’t mess with tradition.” they say. Sigh. I would love to mess with tradition and change things up a bit. But… then there would likely be a massive revolt at our Thanksgiving table. And I hate family drama more than they hate change. “But Prime Rib is for Christmas!“… they whined…. Okay. Fine. They win. We are sticking to tradition…. 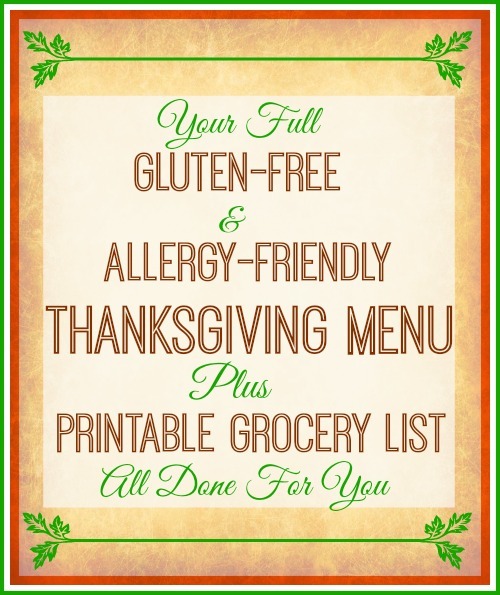 Our entire Gluten-Free and Allergy-Friendly Thanksgiving Tradition – the Menu, from start to finish, including my plan, timing, a printable grocery list, and everything in between. 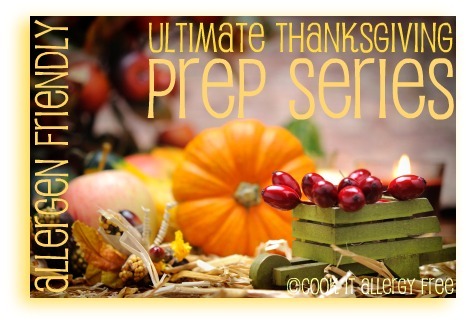 Your Thanksgiving – COMPLETELY DONE FOR YOU! And since my family looks forward to this meal all year long (even the ones without ANY food allergies or food restrictions), you can feel fairly confident that your family should love it too! 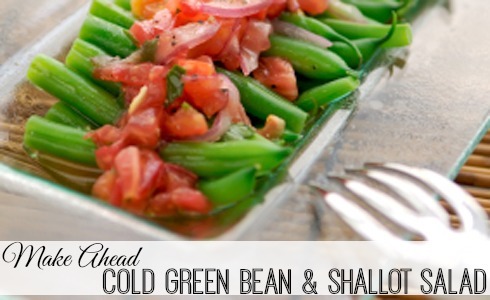 The Cold Green Bean and Shallot Salad Recipe-This is a great one to make ahead of time so that you don’t even have to worry about it the day of. In fact, this one is best when it gets to sit for a day in the fridge. 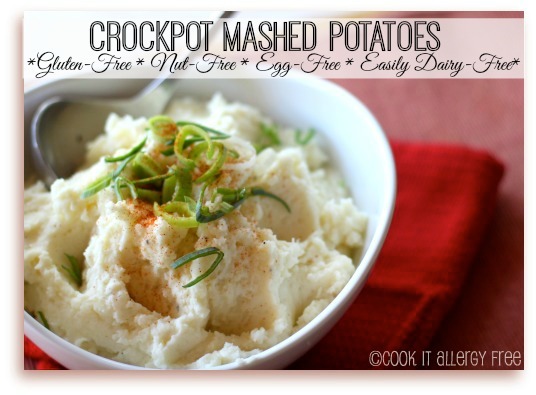 The Crock-Pot Mashed Potato Recipe-This recipe is great because you can make it the morning of and then not worry about it again until it is time to serve it up at mealtime…another little trick to a stress-less Thanksgiving meal. Plus, there are 4 secrets included here to give you perfect (aka non-gummy) mashed potatoes EVERY time! There is also a recipe for Allergy-Friendly Cornbread on this post too…. 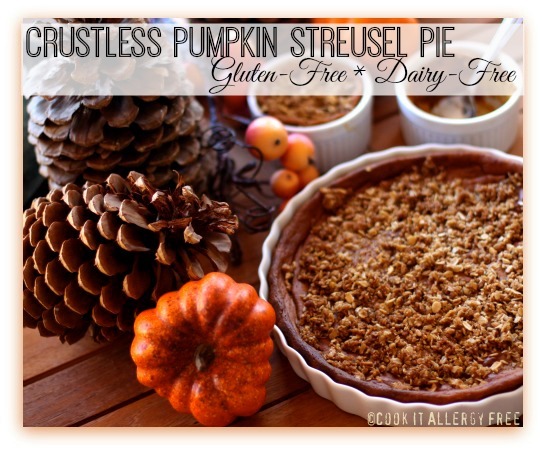 The Crustless Streusel Pumpkin Pie Recipe – This is one of those recipes that is so easy to make that it will shock and awe you. 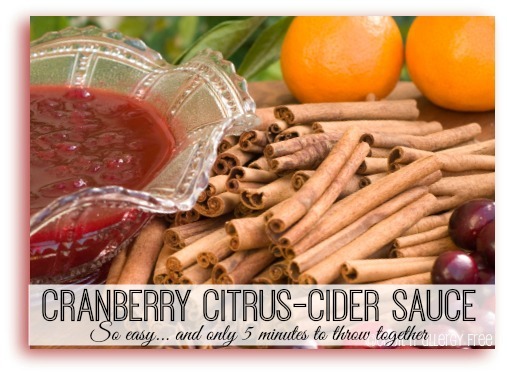 You literally put all of the ingredients in the blender and pour into your pie dish. Then part-way through baking it you top it with that amazing streusel topping and then let it finish cooking…and you end up with this incredible pumpkin pie with a streusel topping that is far more addicting than should be possible… all totally allergy-friendly. OKAY…now that you have your menu…you need a plan to pull it off without feeling stressed out and overwhelmed. Here it is spelled out and organized. From the shopping, to the cooking, to the serving. It is all set for you. And now that you have your plan…you need your shopping list to hit the ground running. If you make this menu from start to finish, this list has EVERYTHING you need. Just head to the store with it and you are good to go! I hope your Thanksgiving is filled with family, friends, amazing food, and lots and lots of traditions! You can be sure mine will be… my family won’t let it be any other way. Alison!! How are you? Long time no talk..for sure. 😉 All is well on this end! I hope you and your family are doing well and that you all have an amazing Thanksgiving holiday! And thank YOU for sharing this with your peeps! Love it! Bring some leftovers for my birthday please. Amazing Kim. You an make it look easy, but I still think you are superwoman! This is going to be my first year hosting a “real” Thanksgiving – so I better get my act together! This list is full of amazing recipes. With a husband and 2 kids who can’t have dairy, a nephew that can’t have dairy, eggs, gluten, peanuts or sesame, and me – a celiac with an egg allergy – this is a gift from heaven!! THANK YOU! oooo pumpkin streusel pie?! Yummmy!!! The streusel is dangerously addicting, Jen! 🙂 Happy Thanksgiving! This is my third year using your recipes Kim. This year I have 17 coming for dinner. Do you think I should increase the stuffing amount? Can’t remember how much we had left over last year when I only had 12. Hi Hiromi!! YAY! So happy you are still using the recipes! 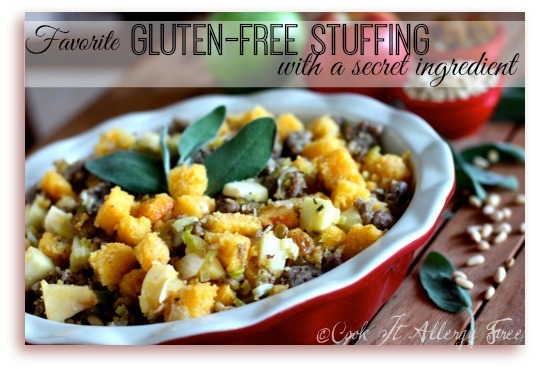 For your stuffing question, I also have 17 coming this year and I am going one-and-a-half the recipe, just in case. That way there are extras for leftovers at least. 🙂 I hope you have a wonderful Thanksgiving and cannot wait to hear how all of the recipes turned out again! Thanks Kim will do the same. I made both stuffings the first year but the family said the cornbread one was better so have only made yours since. If I have time would like to try the salted caramel tart. Looks amazing.